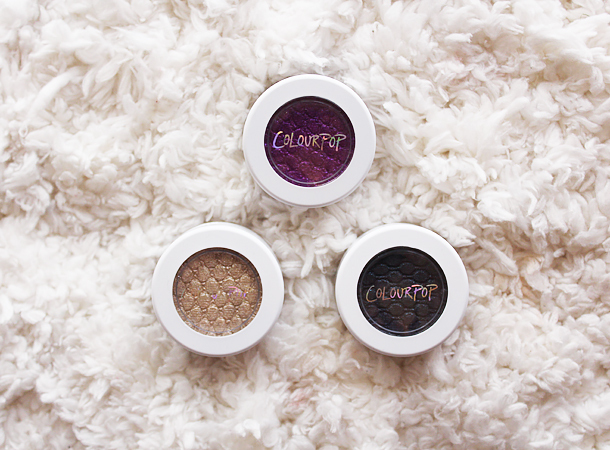 I think ColourPop Cosmetics is one of the biggest breakout brands from 2014. They created a lot of buzz last year and I predict that they will have an amazing 2015. I can’t wait to see their range expand and try the new products they come out with. I made a small purchase to see if their products lived up to the hype. 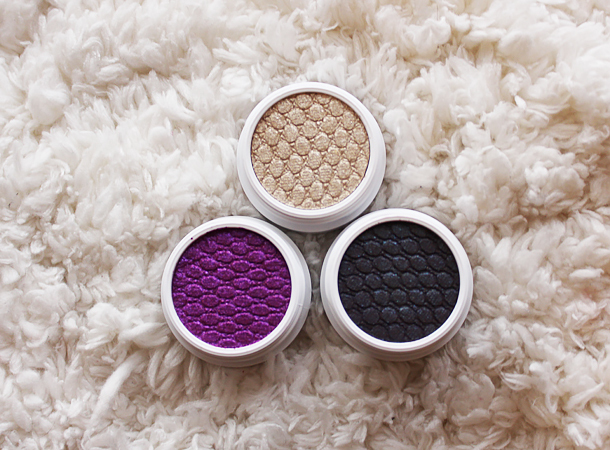 Today I’ll be reviewing two eyeshadows and one pressed pigment: Fringe, Bae, and Fantasy. Each one costs $5. 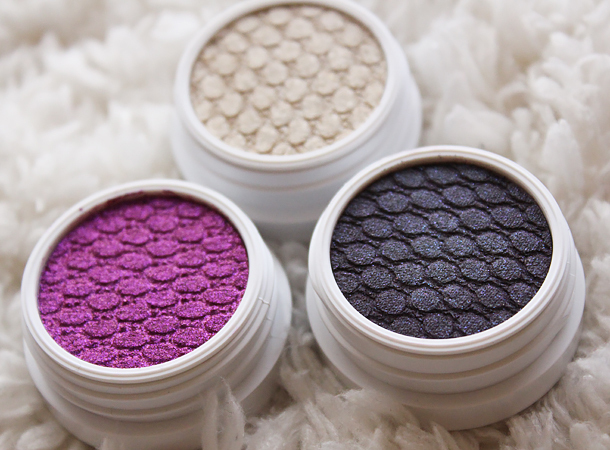 People have mentioned that ColourPop eyeshadows have a cushiony cream-hybrid texture. Initially, I was hesitant to try them because of this. Although I love cream eyeshadows, I recognize that sometimes their versatility isn’t the best. They make great eyeshadow bases and are beautiful stand alone colors, but creams don’t blend well over powders or too close to them. Thankfully, you don’t have to worry about that with ColourPop eyeshadows. The formula is more of a cream-to-powder mousse which feels drier than most cream eyeshadows. It blends very well under, over, and close to powders. The pigmentation is very, very good. So is the longevity. They apply best with synthetic brushes or fingers. I am in love with these eyeshadows, their depth, and the overall color selection available from ColourPop. Also, if you already own MAC Club Eyeshadow and are afraid Bae is too similar to it, do not worry. Bae has a redder/maroon base and its duochrome glitter is stronger. Fringe is an absolute must-have! It’s so metallic and reflective; a total crowd pleaser which gets many compliments. I used Fringe in a previous makeup look here and Fantasy in this one. Look out for a look featuring Bae in the future! A note on their customer service: I had a great experience ordering from ColourPop but found their processing time to be a little slow (five days to ship). I understand that they’re a small company and have recently been plugged by many popular influencers on social media, but customers are accustomed to fast online turnarounds and feel anxious when their paid merchandise isn’t shipped promptly (at least I do!) One thing I really liked is that they sent me a very sweet handwritten note with my order. What are your recommendations from ColourPop? I’m hoping to make another order in the upcoming months. I'm pretty impressed with how vibrant they are! Gorgeous colors! Wow i love the pinky one! I've never tried anything from them, but the color swatches you have here makes me want to try them out now! I need to get my hands on these, I've heard so much about the brand! Not sure if they ship to the UK or not though. Lovely post. Wow these colours look amazing. I really like Fantasy and Bae. My oh my these eye shadows look like something else, they are utterly beautiful. I know deep down I wouldn't wear them myself (I don't think) but for a party or another special occasion I reckon I could try. I've heard so many good things about ColourPop, but I'm afraid their eyeshadows will smear onto my contacts. I can't wear a lot of my cream eyeshadows anymore because of them 🙁 The three shades you have are BEAUTIFUL. I've been so so so tempted by Colour Pop. I just love the brand aesthetic, plus their products sound and look amazing of course. These shades are stunning! Colour Pop sounds like a great brand! I've heard so much about them and their shades are amazing! I would highly recommend "so quiche" – I've never seen a color like it! So amazing! OMG YES! I saw swatches not too long ago, it's so beautiful! i'm going to need to pick up fringe — it's gorgeous. i highly recommend their highlighters. i got a mini when they did a sneak peek and i am absolutely in love. wisp is gorgeous. also, the rebound foursome, cheerio blush, and pitch lipstick. all gorgeous. i've heard so much about colourpop and i really want to try some of their products, it's just a shame that they don't actually work out too cheap when you have to add on international shipping which, when you want to order say 5-6 things, ends up costing you about $20 on top of the $30 you're spending on products! i'm pretty desperate to get my hands on their bichette lipstick though, it looks gorgeous! I've been really wanting to try ColourPop! These swatches are fantastic. I cannot wait to see what looks you put together with these!, Coco! OMG, I love these shades, they are so bright and gorgeous! Wow, these eyeshadows are stunning! I need "Fantasy" in my life! TAKE MY MONEY! I've been lusting after several shades now, including BAE! As I have nothing similar to it at all in my stash and can't believe how cheap they are! Drugstore eyeshadow singles/duos/trios/quad cost x3 the price of those here so I can't wait till they ship to more countries! Ugh! They're so gorgeous! I hope they go international very soon! I ordered some of these shadows last week. I am so anxious to get them! the pgimentation is so impressive and the price is unbelievable! Bae looks like a dupe for one of the colors in WnW comfort zone palette. I have heard so much good things about colour pop eyeshadows and these colours are absolutely gorgeous, definitely have to check them out !! Bae and Fringe are my favorites! I love them and I wish to try them soon! GUH I need to get my hands on their stuff!